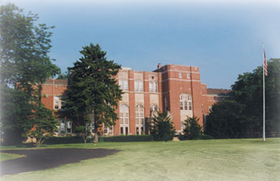 Prairie School of DuPage is situated on 42 acres of woods, water, orchards and open fields in downtown Wheaton, IL. Through all four seasons, Prairie School students begin every day with Outdoor Observations. While the Primary (4-6 year old) students use this time to explore and discover the natural world around them, the Elementary (6-14 year old) students hike the grounds, birdwatching, observing and recording the daily changes and patterns in the school garden, the weather, the wildlife, and the surrounding landscape. When the weather permits many subjects, such as yoga, science, and visual arts are held outside as well, using nature as inspiration for a project, or just as a relaxing environment. The children also have a 60 minute lunch/recess each day for free outdoor time to run, climb, build, explore and discover the world around them. The walking paths at the south end of campus connect to the walking paths that run through Northside Park. This creates an extended campus for Prairie School giving the students more opportunities to hike, go birding, observe wildlife, sled, canoe, and discover the natural world. Chipmunk Valley is the natural playground at Prairie School. There are swings, a climbing rope, sand pit, playhouse, wood-chipped area with natural building materials, and a small wooded area with a wood chip path that leads from one side of Chipmunk Valley to the other. This natural playground was certified in 2014 by The National Arbor Day Foundation as a Nature Explore Classroom. The Prairie School Garden is an integral part of math, science and literacy. Primary students work in a collaborative class garden while elementary students plot out their own gardens. Elementary students harvest the vegetables from the garden to be used in a cooking unit where they prepare a meal for the Prairie families under the harvest moon. Some of what elementary students prepare is frozen and saved for camping trips throughout the year. Once inside, each class spends half of their day in their respective main classrooms. Academic subjects of math, language arts, social studies or history, geography and science are integrated into individualized and project-based activities. The classrooms change as the season changes, and the room reflects the students' ongoing projects and discoveries. Elementary students eat lunch in Chipmunk Valley when weather permits, and in the school cafeteria during the colder months. The auditorium holds large movement and music classes, and on any given day, many of the classes may held outside. The Prairie School of DuPage has a long-term rental agreement with The Theosophical Society in America. Both organizations share an affinity for the natural world. The green space surrounding our classrooms allows Prairie School to integrate the natural world into the curriculum, an integral part of place-based education. The TS grounds are vegetarian, and out of respect for our hosts, Prairie School snacks and lunches are required to be meat-free.